Description: Studio Edition ornament originally offered at the 20 in-store signing events held in 2008. 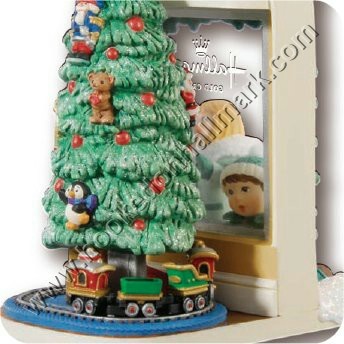 The ornament features work from 18 Hallmark artists. Two children peer into the window of a Hallmark Store. A beautiful complement to the Christmas Window Club Series. Size: 5" H x 3¾" x 2¾"
Of course you have to check out the Hallmark shop. Love the detail, a Hallmark shopping bag.